-- Select a Size -- 1.5" Paw Width 1.75" Paw Width 2" Paw Width 2.25" Paw Width 2.5" Paw Width 2.75" Paw Width 3" Paw Width 3.25" Paw Width - Out of Stock! Conquer the mountain with your hiking buddy in a set of high-traction, rugged all-terrain Grip Trex Dog Boots by RuffWear in Blue Spring with Gray Trim. We love the practicality and extreme ruggedness of these backcountry dog shoes. These high traction dog boots with rugged lug pattern provide stability on natural, rough, or unstable terrain. The Grip Trex Dog Boots by RuffWear features non-marking Vibram outsoles with a new multi-directional, flexible lug design that gives your dog tactile control on terra firma. A one-piece mud guard enhances the fit and long-term durability of the boot. Tightly woven air mesh keeps dirt and debris out while providing superior ventilation. 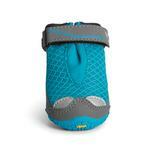 An adjustable closure strap ensures a customized fit for nearly any paw. 3M reflective details provide low-light visibility from multiple angles. Rugged protection for your rugged dog. To clean just secure fasteners than, wash in cold water on gentle cycle in a mild detergent and air dry. Set of 4 dog boots. Grip Trex Dog Boots by RuffWear - 4 Pack - Blue Spring with Gray Trim Customer Photos - Send us your photo! Posted On 08/30/17 by Michael G from New York, NY Yes, Michael G recommends this product! Posted On 04/10/17 by Diana M from Tinley Park, IL Yes, Diana M recommends this product! I have ordered these boots regularly for my 9 year old soft coated wheaten terrier. We have hardwood floors throughout our home and he was sliding, falling down the stairs and scratching up the floors. We have no problem putting the boots on our dog every morning and he wears them all day long. I just wish that they would reinforce the plastic loop that the velcros strap goes through because my dog has been able to pull it off. That is the only problem I see with these boots. Also, I love BaxterBoo because they truly seem to appreciate my order and send me a coupon for my next order. Posted On 04/02/17 by Jackie from Philadelphia, PA Yes, Jackie recommends this product! These boots are as well-made as any pair of high-end boots you'd buy for yourself. 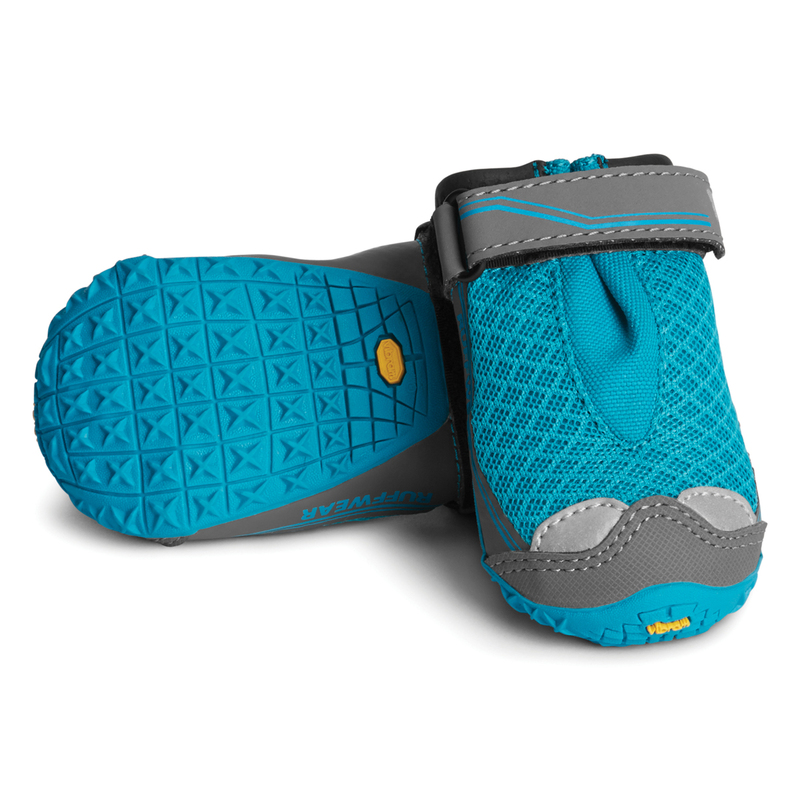 They feature a durable Vibram sole, and fit securely on your dog's paw. Another great Ruffwear product, A+! Posted On 03/18/17 by Jade W from Haymarket , VA Yes, Jade W recommends this product! These little boots are as cute as they are durable! I love that the Velcro goes all the way around the boot so it stays on as tightly as you need it to so your dog cannot fling the boots off! My dog didn't like them at first but after a few minutes she was comfy and ready to go hiking so do not be discouraged if your dog is wary of the boots at first it WILL pass! I am definitely getting another pair of these when I wear this pair out! LOVE them! Posted On 06/16/16 by Sonia T from Wauconda, IL Yes, Sonia T recommends this product! These are not just boots that someone thought would appeal to the over indulgent pet owner (thus increasing the manufacturers revenue). They ARE practical & necessary for protecting your pets pads from unseen, unknown, unaware situations (glass, sharp rocks, toxic chemicals, scalding summer pavement, etc.). They (Ruffwear) use the same workmanship & materials that are on high-end "Human Item's" while still taking into consideration the season it will be used in & overall comfort & safety for your pet. Their "Customer Service Department" is a walk through the past (they will go out of their way to help anyway possible so their product is understood & utilized to its fullest potential). Their pride stems knowing that they are not just a representative working for a line of pet products, but that they represent the overall "Best" product on the market. I'm on a fixed income, EVERY penny is accounted for & necessity is the key for ANY purchase. Ruffwear IS a necessity! Posted On 03/24/16 by Charice H from Lakewood, CO Yes, Charice H recommends this product! Love these. My dog has another pair of boots but they don't have traction or rubber. It's more like a leather, well these and their traction is great. I got them for my dog to be more sure footed when we paddle board so more testing to do come summer. But love theme and the color. I love BaxterBoo! Very good Price and High quality clothing.